Proposing is one of the most exciting things a guy will ever do. but despite a "Yes!" answer many a man has come away from asking for his lady’s hand thinking he could have done a better job. Have a sinking feeling that this could soon be you? Get prepared with these nine proposal tips, courtesy of the pros. While this one may seem obvious, plenty of guys have popped the question without the bling. “But the ring is so important because it symbolizes the commitment,” says Michele Velazquez, co-owner of proposal and romantic event planning company The Heart Bandits. Most men only put aside money for the ring, but don’t even think about saving for the actual proposal itself, says Velazquez. Velazquez warns against simply putting the ring in your pocket with the mindset that you’ll just spring it on your girlfriend when the time feels right. Instead, decide on a solid concept, create a plan and have backup plans. No idea where to start? It’s always smart to incorporate her favorite things or fondest memories, says Rodriguez. And keep an ear open for places she says she wants to go or things she would love to do together. “If your girlfriend loves to be center of attention, then planning a public proposal might be a great idea,” says Velazquez. “But if she’s shy, you probably want to propose privately.” Don’t make the mistake of designing the proposal around things you like, she adds. For instance, if you love hockey and she doesn’t, don’t propose on a hockey rink just because you think that would be awesome. 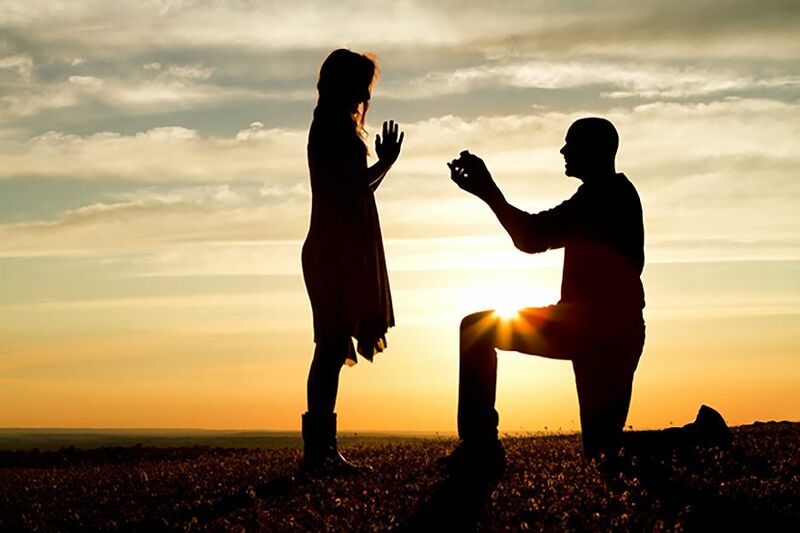 Arrange to have the proposal photographed or filmed, suggests Rodriguez. This way you get to watch what actually happened, and you can share the special experience with family and friends. “We provide a female’s prospective, we save you money with our resources, the girlfriend and the ring get the presentation they deserve, and you get to experience the joyful moment, too,” says Rodriguez. Base packages for proposal planning are typically in the $90-$100 range and include an interview followed by personalized proposal concepts. If you want assistance executing the event, expect to pay around 10 times that – or more. “If you need us to arrange a helicopter landing on a golf course it will cost more than if you want to hire us to set up a blanket on the beach,” says Velazquez. Yes – it will likely be one of the most stressful events in your life, Velazquez acknowledges, but keep in mind that you’ve found the woman you want to spend the rest of your life with, so enjoy it!